It doesn't take much to make your army look good. It's as simple as a wash and a highlight in most cases. Occasionally, I'll do things for people to help them improve their armies. In this case, I got the job of painting shoulderpad icons on a squad of 20 Imperial Guard. The troops came to me with just their base colors on (read: completely painted). 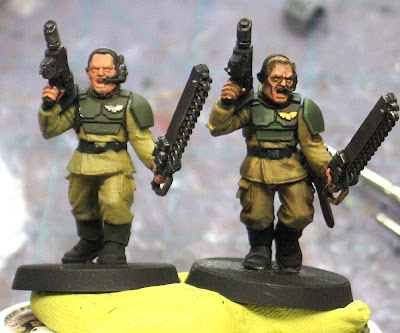 While painting icons on shoulderpads, I decided to help my fellow Old Timer out and I added two more painting steps to his models to show him just how easy it is for one and how quickly it makes your models go from just painted to really looking like completed models. Now, we have that kind of relationship where I can do this to his models... it's not something I do to everyone's models I get. I've done this once before with a Lord of the Rings model for another person to show him how it easy it was to get from base colors to finished model with just one wash and single highlight. I didn't do anything to the models other than to add paint. I didn't clean anything up, repaint anything or do any touch ups. I simply added a wash (different colors for different areas) and then a single line highlight after that. Starting with 20 Guardsmen who came to me with their base colors already applied, it took me an afternoon (about 4 hours) to get them "finished." Now they still need to be based, but we all know how incredibly easy that is to do. The point of this whole thing is this, it doesn't take all kinds of fancy, intricate, involved techniques to make models look good. It really comes down to a wash and a highlight. By just adding those two things, you can improve a model's appearance dramatically. Couldn't agree more. Now that the new washes are around everyone can have nice looking models with a bare minimum of effort. Anyone out there who is nervous of painting: Pick up the washes, it'll be the best painting money you've ever spent. Use them generously, avoid pooling on flat areas and they'll do wonders. I really do rely on washes to get my models to a passable state for putting down onto the table, they make a huge difference at the cost of so little effort. The picture you provided really brings the point across well. It really amazing what a difference a little depth can make! And the hardest part was the highlighting, I'm sure. Using a wash sure is a great help, and I too use different colors as a rule. The picture says it all, especially in the face. Good prop! Pirate: Excellent point on the pooling. Akhrin: You hit the nail on the head I think, it really is a cost/time issue. Geek: I try to the people I talk to in real life about "depth" and how it brings things to life. Other Kevin: The whole post was built around that pic. When I compared the models together, I knew I had to snap a pic and show you guys the difference. When I'm trying to get through a ton of guys I do something similar... except I do the highlight first then the wash. That way I can be a little faster with the highlight because the wash will blend it a little.